OK, despite the hyperbolic conclusion this is an important time piece which keeps this historic brand bang up to date and at the cutting edge of wearable tech. Further more, the design of the watch is likely to have a broader appeal than Apple’s Watch amongst watch connoisseurs as the latter has received a mixed reaction to its styling. The TAG Android watch retails at £1,100.00 and delivers audio streaming, Bluetooth and Wi-Fi, although apparently no NFC capability (so one up for Apple). Backing this up is 4GB of memory and an “all day” lithium battery. Recent research from analyst firm Juniper Research predicted that the number of smartwatches worldwide is expected to pass 100 million within the next five years, as the range of devices on the market increases dramatically. Wearable tech and sport go hand in hand so we can expect some very clever customer engagement via this device and other TAG partners, of which more below. 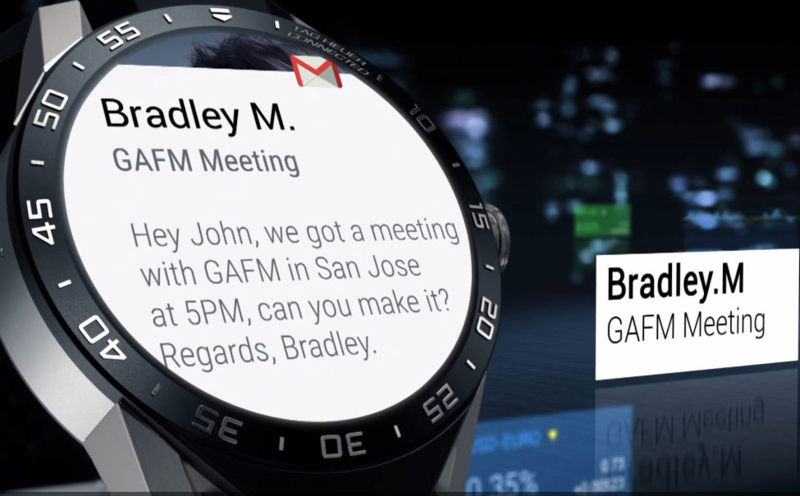 However, TAG Heuer isn’t the first watch brand running Android Wear that Google has partnered with as LG also announced the launch of their “luxury smartwatch” in February this year. The reason this partnership works so well for both parties is that it underpins Google / Androids advanced techology base and TAG’s precision time keeping and design heritage. For those less familiar with motorsport, TAG Heuer is a time keeping pioneer having patented the first dashboard chronograph in 1911 and established driver ambassadorship as far back as 1969 with Jo Siffert. The brand was also the first non-technical partner of a Formula 1 team in the 1970’s (Ferrari) and have been a brand partner of the McClaren team (another one of our favourite brands) since 1985 to present day – thirty years of brand partnership with both drivers: Jenson Button and Fernando Alonso being the current brand ambassadors. TAG Heuer with its heritage of technical development and craftsmanship is always looking forwards, and prior to this latest announcement further developed its role in motorsport as Official Timekeeper, Official Watch and Chronograph and Technical Founding Partner of the new electric powered FIA Formula E Championship. Formula E launched its inaugural season in 2014. Again the fit with Formula E is perfect as TAG Heuer has been deeply involved with sustainability for many years – the solar panel roofs of the manufacturing facility in Switzerland provide power for the plant plus the brand also partnered Tesla on the very first ever word tour in 100% electric GT car in 2011. The secret to success in such partnerships is clear – a thorough understanding of the each brand’s DNA and how they compliment each other. The closer the fit the better the benefits and the clearer the marketing messaging for both parties.